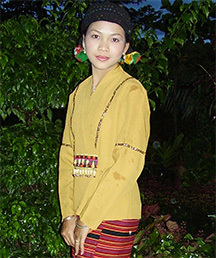 The Shan peoples (Shan: ; IPA: [tɑ́ɪ], IPA: [ʃán lùmjóʊ]; Chinese: 掸族; pinyin: Shànzú；傣族) are a Tai ethnic group of South East Asia. The Shan live mostly in Shan State, Myanmar. These people have close religious ties and similarities with Bangladesh's Chittagonian peoples. This page was last changed on 4 February 2016, at 13:44.